The Lower St. Croix National Scenic Riverway includes the lower 52 miles of the St. Croix River between Taylors Falls, MN/St. 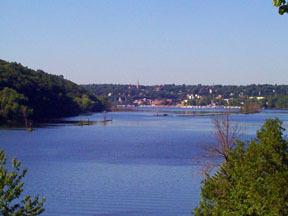 Croix Falls, WI and the confluence with the Mississippi River at Point Douglas, MN/Prescott, WI. The lower St. Croix was the first river added to the National Wild & Scenic Rivers Program by Congress in 1972. The upper 10-mile stretch of the Lower St. Croix is classified as scenic, while the lower 42 miles are classified as "recreational." See: general information on river classification. The riverway is managed jointly by the National Park Service, the Minnesota DNR and the Wisconsin DNR. National Park Service land acquisition authority is limited to the upper 27 miles of the riverway (from Taylor's Falls to Stillwater). The National Park Service prepared a Final Cooperative Management Plan and Environmental Impact Statement for the Lower St. Croix National Scenic Riverway.